Note the styling of these vehicles. It’s interesting how our vision of the future rests heavily on contemporary design aesthetic. A great example of this is the NCC Enterprise, check out a comparison over at bin.false.org. 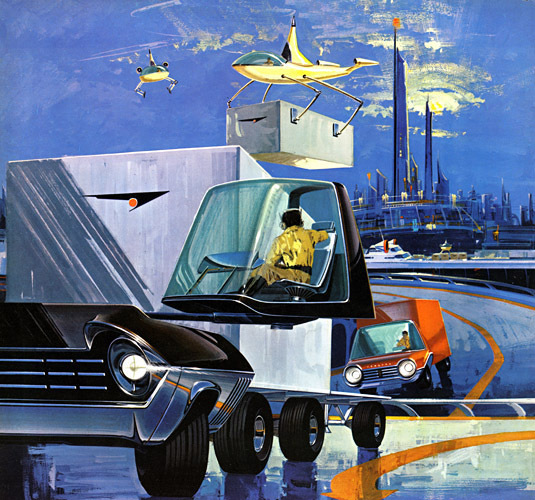 Just as these vehicles no doubt looked futuristic to people of the 1950s or 60s and look quaint to us, no doubt our visions of the future such as Star Wars and Battlestar Galactica will seem naive 50 or 100 years or more hence. This entry was posted on October 9, 2009 at 11:59 pm and is filed under Retro Art. You can follow any responses to this entry through the RSS 2.0 feed. You can leave a response, or trackback from your own site.